During the campaign, new excavation work was conducted but, as with any project which is a continuation of several seasons of excavations, it was necessary to include in its course extra documentation work in the stores and some conservation activities. During two months in the field, team members spent time in the SCA stores at the Carter House in West Thebes recording the ostraca and other finds from the last four campaigns. Restorers cleaned cartonnage fragments and consolidated the ostraca. Conservators also had a job to do inside the rock hermitage, having to clean the wall paintings, consolidate the painting layer, reinforce and preserve the tiled floor with the cross ornament in the neighboring hermitage (see below). 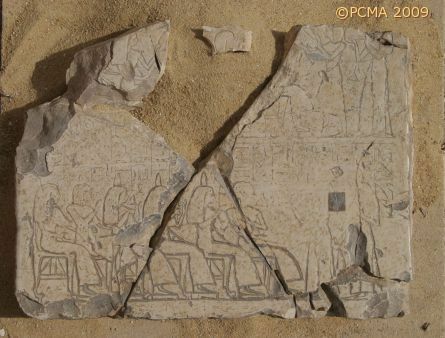 They also had to recompose and clean two limestone slabs with relief decoration from the Pharaonic period reused by the Copts as floor tiles inside the hermitage. Meanwhile archaeologists concentrated on clearing the entire area in front of the neighboring Tomb 1151, also testing Winlock’s archaeological dump from the 1920s. Only a few objects were recovered from the dump, some of them, mostly potsherds, dating from the Coptic period. 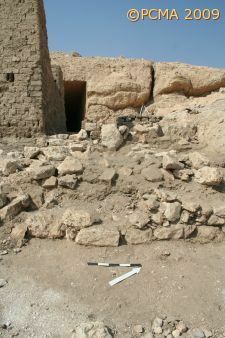 A rock niche east of the entrance to this tomb contained a big number of sherds from a container made of unfired clay. The corridor inside this tomb reaches 14 m into the mountainside. 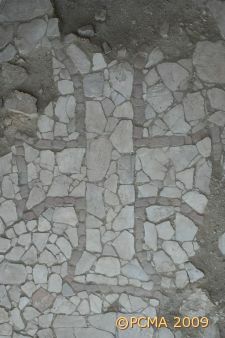 The floor in the entrance was made of irregular flat stone tiles covering an area 2.90 m by 1.52 m. Cut pieces of red brick were set into this floor to form the outlines of a large cross. Returning to the main hermitage, the team concentrated on clearing the stone steps leading to the courtyard and on testing inside the tomb corridor. A bench just inside the entrance yielded fragments of three Coptic letters written on papyrus. About 6 m in, a rock shaft was discovered descending about 3 m to a subterranean storage chamber. The monks may have excavated it for storage purposes, but it could also have been a secondary burial chamber from the Pharaonic period. In any case, the monks adapted the space for their own use, introducing a small vestibule of mud brick under a vaulted roof. The fill inside this “cellar” yielded a mixed bag of Pharaonic and Coptic objects, the most interesting being ostraca, writing exercises on a limestone chip with the names of Simon and Joseph (presumed monks), a reed pen and two sketch designs of ornaments on limestone chips. The latter upon analysis have contributed to a better understanding of the creative artistic process among the monks living in this hermitage probably in the 7th century (for a discussion of these objects in greater detail, see T. Górecki, Limestone flake with a drawing of a guilloche. A contribution to the designing of Theban hermitage wall decoration, Etudes et Travaux XXII, 2008, 61-68). 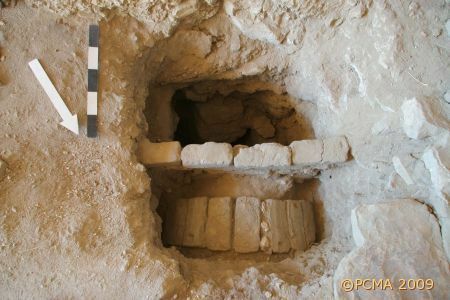 Further inside the tomb, six narrow test pits were excavated along the walls of the corridor in places where the original stratigraphy of the rather shallow fill in this part of the tomb appeared to be undisturbed. Both leveling and occupational layers were recorded. The original occupation by monks in the beginning of the 6th century left a thin layer that filled in all the irregularities in the rock floor. The ashes and burnt stone on top of this layer also date to the 6th-7th century phase of use of the hermitage. In the second phase, when the monks introduced a stone-tile floor in the corridor (second half of 7th-8th century), they first laid a bedding layer of rock debris containing many very poorly preserved objects from the Pharaonic period. The tiled floor followed.